A serene lake located close to Albuquerque (24 miles west of Grants, NM) Bluewater not only offers excellent year round fishing but scenic views of the Zuni mountains as well. 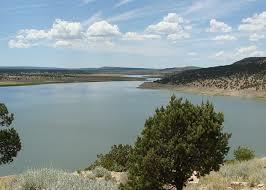 Bluewater offers the best Tiger Muskie fishing in New Mexico. Go west on I-40 past Grants, continue 19 miles to the Prewitt/Bluewater exit. Take NM 412, follow signs 12 miles to Bluewater State Park. No reports at this time, we have heard reports that the lake is open with no ice.